The Confluence Gallery & Art Center is excited to offer its summer art class from the multitalented Janet Fagan who will teach block printing July 28-29. Janet Fagan will teach students general wood carving techniques, how to work with and layer different materials when working in mixed media, and how to plan efficiently for a mixed media piece using many different materials. Students will learn step-by-step to draw, carve and print a relief print on pine board and incorporate prints into mixed media paintings as a collage element. Janet Fagan is always searching for new ways to combine her two loves – painting and printmaking, because it is within the contrast of these two approaches to image making that she finds the truest expression of her heart’s response to life. Janet’s love affair with printmaking began 30 years ago at the Pennsylvania Academy of Fine Arts in Philadelphia, where she studied woodblock printing with Dan Miller. 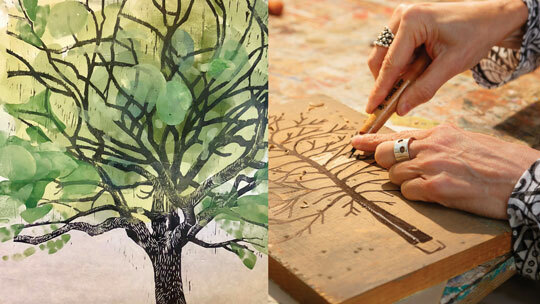 She now continues to create block prints and uses the printing process in her mixed media pieces as well. Janet has taught drawing, painting and printmaking classes for the past 25 years including classes at the Gage Academy, Seattle Art Museum, and the Frye Museum in Seattle. Inspired by the natural world, Janet is currently exploring a series of prints based on the wild creatures she shares her outdoor time with. Combining the graphic quality of relief printing with the spontaneity of mono-printing and painterly mixed media techniques is emblematic of Janet’s experimental and intuitive approach to painting and printing. Her work is available in Seattle at the Art Study in University Village and in the Methow at Confluence Gallery. Janet has exhibited in Florida, Georgia, and Washington and her work can be found in both public and private collections. Janet has acted as a Juror for National exhibits as well as for various non-profits in the Puget Sound area she now calls home. She has taught extensively in the Northwest for the past 15 years, both privately and as an Art Educator and Teaching Artist for the Seattle Art Museum. She has also worked as an Educator at the Bill and Melinda Gates Foundation Discovery Center for the last five years. Beyond her work in the arts, Janet is passionate about long-distance trail running, skate skiing, playing the fiddle, and travel. She lives in Seattle with her cats Dune and Sylvio and her beloved partner, James. DATES: July 28-29. FEE: $150. LOCATION: Confluence Gallery. INFO: 509-997-ARTS.